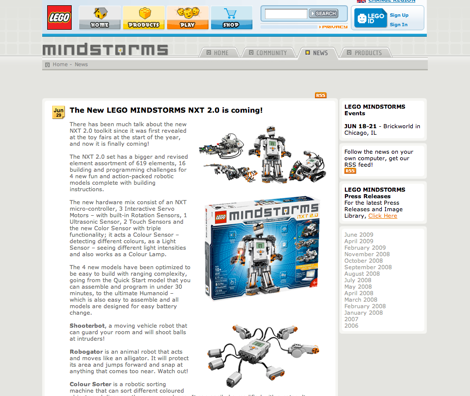 Right after I mentioned the absence of an official announcement of the NXT 2.0 set on the MINDSTORMS site, I received a LEGO catalog in the mail that featured the set and showed it shipping “August 1.” I quickly checked the official LEGO online store and, yup, found the NXT 2.0 set (thought not for pre-order yet). I’m sure many more details will come out in the next two months. 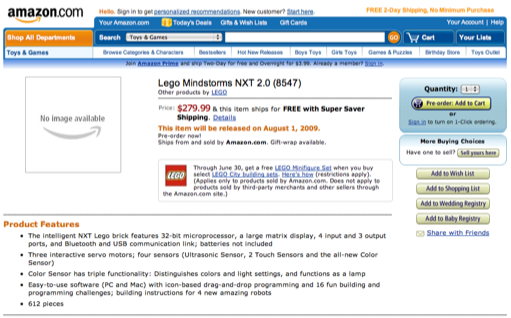 In just the past few days, Amazon.com put up a listing for the LEGO MINDSTORMS NXT 2.0 set in its catalog. Amazon says that the set is available for pre-order and will ship August 1, 2009. 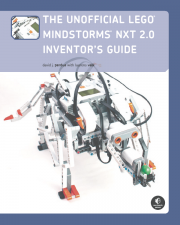 Not even the official MINDSTORMS site has put up the NXT 2.0 set yet, so I find it interesting that it’s available for pre-order on Amazon. Last week I finished teaching the five-day “Hands-On Robotics for Teens” robotics course at Stanford University. As I thought would be the case, the planned robotic sumo event was the highlight of the week. The winning sumo-bot, “Kill-Dozer,” was a treaded vehicle with a slope that had TECHNIC teeth at the end. The design proved to be very effective, enabling it to win even a “king of the hill” round (i.e., pile all the sumo-bots onto the arena and see who lasts the longest). The students, each of which had a computer with Internet access, also enjoyed creating robots from Dave Parker’s excellent nxtprograms.com website. We built the Catapult, Modular Test Vehicle, Machine Gun, Rattlesnake, and more. Below are some random pictures I took during the week. Besides enjoying the robots, I also enjoyed the nice weather there: a high of 70s during most of the week! 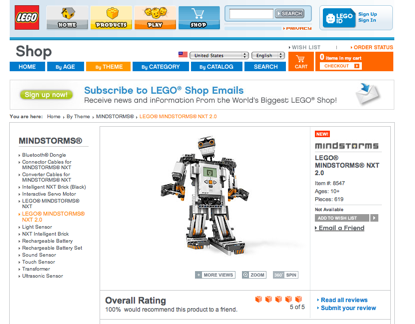 Still struggling to get an idea for a robot to compete in the MINDSTORMS Summer Olympics Building Challenge? Here’s a video of an NXT “Gymnastic Robot” that could inspire you. This robot can really move! The following video was posted in February of 2008 and shows an NXT robot that can always solve the Rubik’s cube—within a minute or less! The robot’s creator is Daniele Benedettelli, who has experimented with a number of robot designs to solve the Rubik’s cube in the fastest possible way. Kevin Clague has released version 4 of his popular LPub program, which is an “LDraw Building Instruction Publishing Tool.” You can download LPub 4 from his website; the program is now compatible with both Windows and Mac OS X. 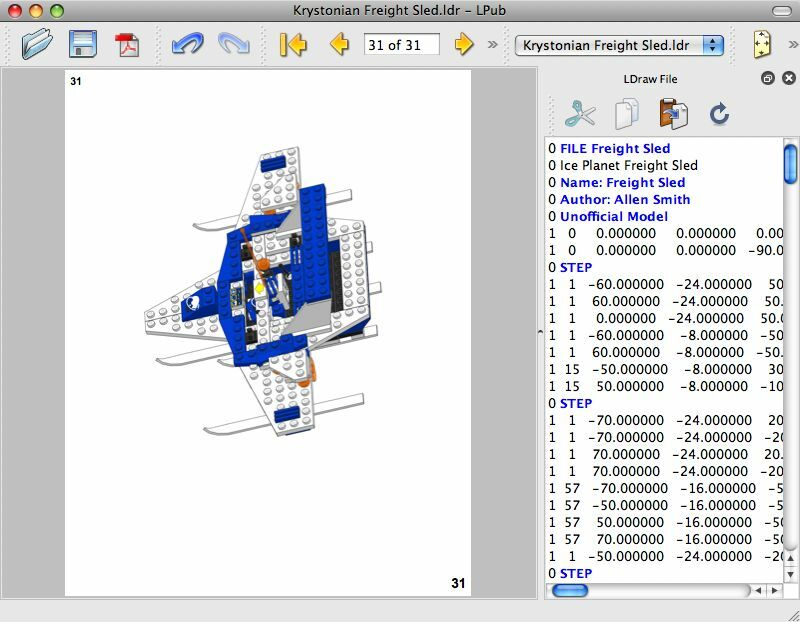 You can see a screen-shot below of the new LPub (the LDraw model shown is made by Allen Smith and included with Bricksmith). I used an earlier version of LPub to generate the building instructions for The Inventor’s Guide and am excited to see this latest version. Creating building instructions is a much easier task with tools like LPub! 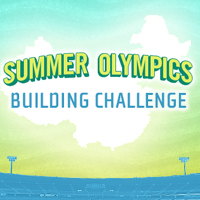 The 2008 Summer Olympic Games will be held from August 8  24, 2008 in Beijing, China! We are challenging all you to create a robot that can compete in one of the summer sports on the Olympic program. 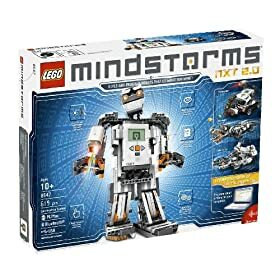 There’s no limit on amount of LEGO MINDSTORMS NXT sensors, motors, HiTechnic sensors, or Bluetooth communication you can use on your MINDSTORMS NXT Summer Olympics Robot.